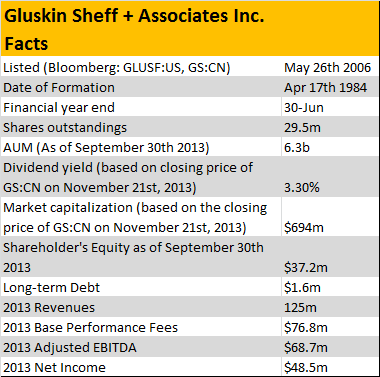 Gluskin Sheff + Associates, Inc. (GS, GLUSF.PK) is a Canadian wealth management firm. In Canada GS is in the prestigious business of serving only high net worth individuals, charity foundations and institutional investors. The business model of wealth management is a very simple one – it’s about helping people to invest their money in return for a fee. GS only manages portfolios of $3 million or more and often asks for even more from new clients. GS is known for serving the Canadian elites, many of them are the richest and most powerful people in Canada. The highest threshold has an average asset per management (AUM) of $67 million per relationship. GS has built a reputation of high-level client service and high performance. As of September 30th 2013, GS had $6.3 billion AUM. 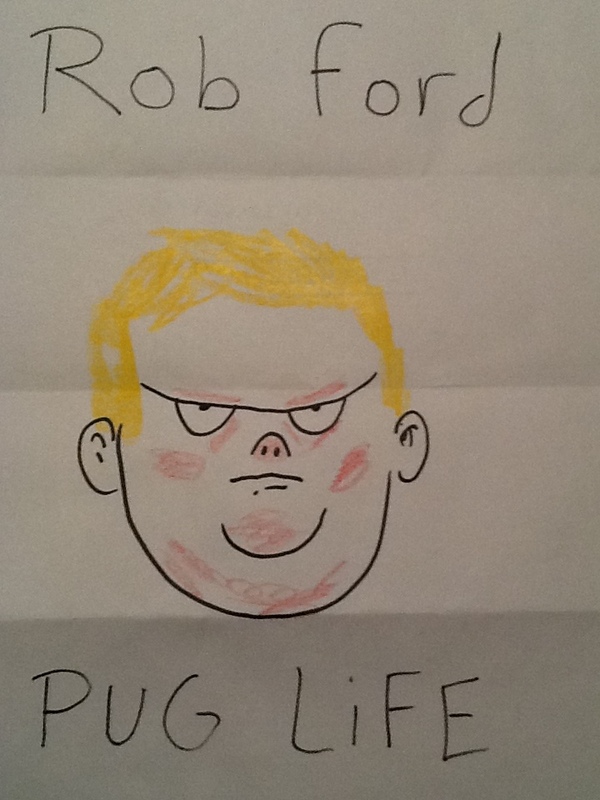 Masterpiece that I got in the mail by my brother Hugh Langis. You can read the full article directly at the WSJ and I am reposting some of the comments below. The point is that there’s a bubble mentality chasing the Twitter IPO and some tech stocks. It reminds me a bit of the tech bubble era of 1999-2000. Good old solid fundamentals such as profits and revenues growth didn’t have as much importance. What was important was the number of eyeballs and clicks your website get and whatever the cab driver recommends. The woman in the article is an administrative assistant. If administrative assistants are lining up to buy an individual tech stock, it’s a good bubble sign. Here are other highlights of the article, my comments are in bold. “I messed up by not buying any Faceboob so I want to get some Twitter,” the 56-year-old administrative assistant said. “I messed up, I was being cheap.” No you did not messed up. FB plunged 40% after its IPO. She said she’s not worried about price increases; she just wants to stick to her purchasing plan and buy the shares immediately, though she hasn’t ruled out selling them quickly if there’s a sharp bump. Clearly speculating, might as well go to the casino. No notion of valuation implied. Ms. Watkins said she’s interested in the hyped stock because of her economics-major nephew and because she knows what happened with Apple Inc. and Facebook Inc. prices and doesn’t want to miss out, even though the 140-character message service, often used on smartphones, is largely foreign to her. “I don’t even use it,” she said. “You know what kind of phone I’ve got? A pre-paid!” ah! The economic major nephew. The Fortune 500 list is full of economists. “I’m just buying because everybody’s talking about Twitter,” she said. “I’m just gonna take a chance.” Another sign of a bubble. That mean the stock will likely be overvalued. If you want to make money in the market you need to buy a bargain stock. You find bargain stock where nobody else is looking. Wall-Street and its investment banks are beating their drums on the next big thing. The Twitter (TWTR) IPO is here and it’s consuming a lopsided amount of the financial media airwaves. The investment banks are looking for a rebound stock after the highly anticipated botched Facebook (FB) IPO. After being approached so many times about my opinion of the Twitter IPO I decided to write a short article to rationalize my thoughts. Some of the people that have approached me are regular people with limited knowledge of the investment world. They have been caught up in the Twitter hype believing they will get rich. When they ask for my opinion I tell them that I like Twitter as a company and that I have an account but it’s not investment worthy. Then they get defensive. They tell me that since the financial media spends most of its time talking about Twitter it’s obviously a guaranteed winner. I will address the financial media issue in more detail below. It’s important to specify that a good company does not necessarily guarantee that it will be an excellent investment. A great investment is when you buy an asset below its intrinsic value and sell it above it. That’s how you make money in investing. The rest is speculation, which is a game that I don’t play because I hate losing money. The point of the article is to educate readers and to approach Twitter with caution. A friend of mine in the industry had this picture posted on his LinkedIn profile. I personally can relate a lot to this story. I have been on both side on this story. I have been the guy that paid bargain prices for what I believed at the time was a steal but it turned out that I was dead wrong. 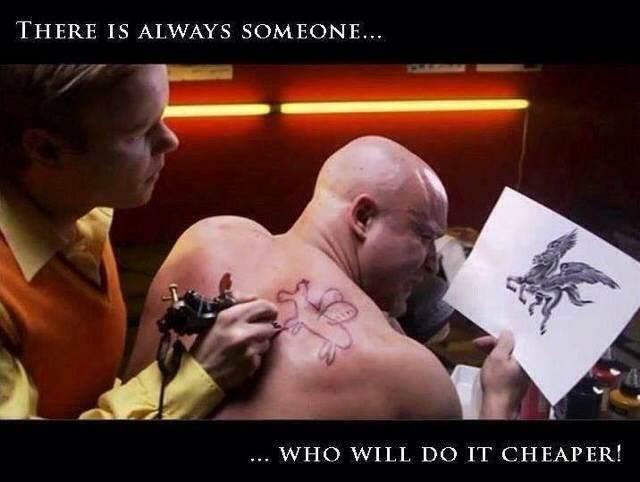 I was also that guy that offered a better service at a more expensive rate but got turned down because of cheaper prices somewhere else only to have the client run back at me to fix the problem. There’s a lot of truth in the picture. Unless your service or product is a commodity (identical product/service), price rules the day. But if you propose a valued-added proposition, you usually get what you paid for. A 6 minute mind blowing video about us and our relation to the universe. There’s no lack of universe/space videos out there but this one takes a different approach. The video starts on Earth and zooms out in space forever and comes back to Earth. The planets and galaxies are apparently up to scale. How am I going to check that? Either way it’s pretty impressive. It definitely resets your mental boundaries. The video is produced by the American Museum of Natural History.